Harvest the field with a big toy combines, chopping up corn using the big rotating header, well emptying contents through the spout with steering from the rear wheels. This is just a few of the replica detail found on the toy combines for sale we've featured below. 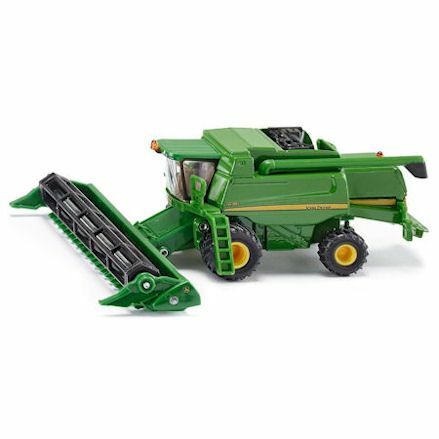 Children will always have an fascination in toy combine harvesters, and there's plenty of detail, features and working parts to keep the interest going. 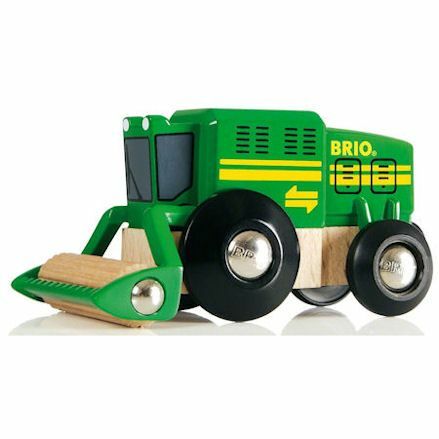 Mostly brought to you by Bruder, Britains and Siku, we also have Brio listed. 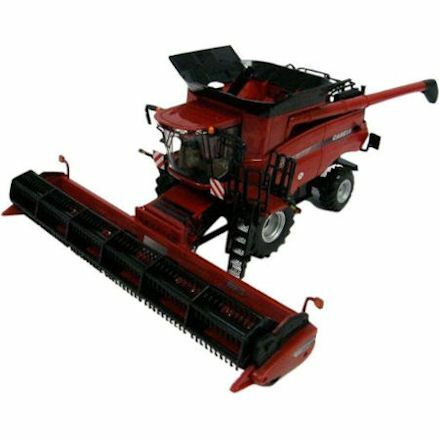 And well all toy combines very in style and size, most have rotating headers, moving spout, driver's cabin, free rolling wheels with rear wheel control. 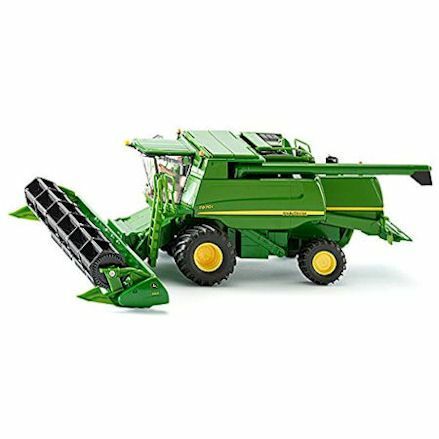 This Britains John Deere combine harvester is made from die-cast in 1:32 scale. It features two detachable headers, pivoting rear axle, movable feed housing, track drive with rolling wheels and grain auger that swings out. 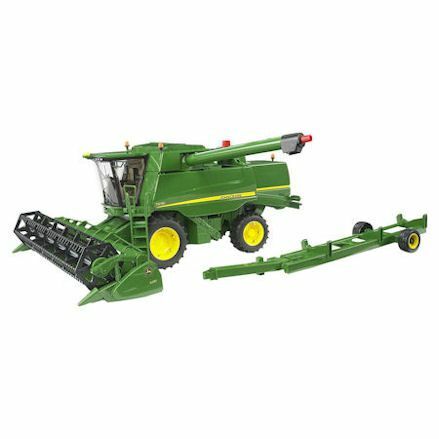 The only 1:32 scale combine you'll need for your farm scene. 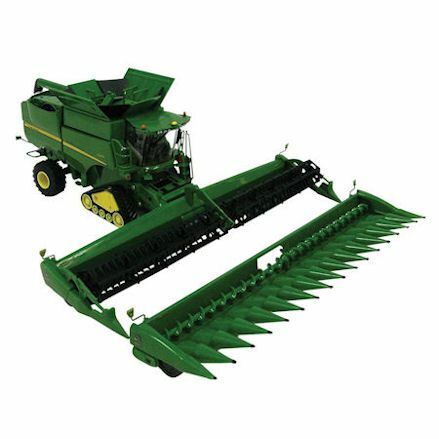 Monster-size Bruder John Deere combine harvester features rear steering. You can access the engine compartment under bonnet, self folding covers on tank and open the door to driver's cabin. The cutter head is powered by friction well the grain tank can be emptied via drain tube. John Deere combine again, only this time in a miniature 1:87 scale. Made from die-cast, featuring rolling wheels, front header moves up and down, pull out spout with amazing detail. 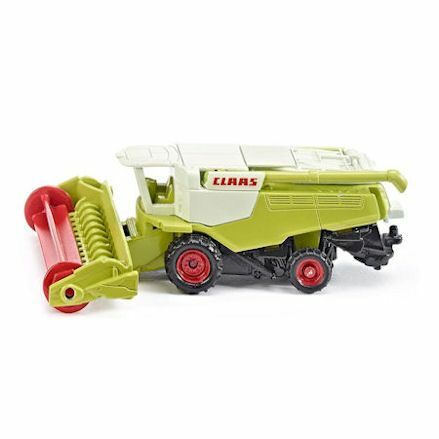 Perfect size combine to fit in with all matchbox and similar size toys. 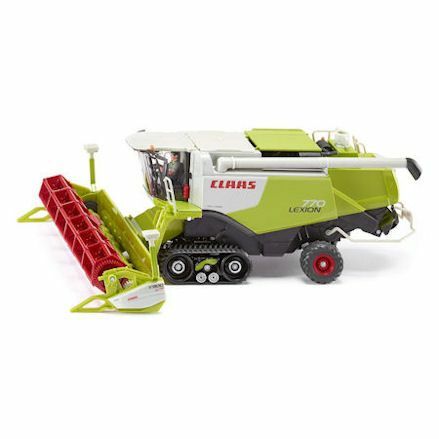 Bright, colourful Bruder Claas combine any child will just love. It features a real working header, grain tank can be emptied via grain spout, rolling wheels and tracks, rear steering and an attractive looking cabin with opening door. It's hard to pick out this Siku from the Britains version, but it finds itself at number five only because it cost more. But this Siku John Deere combine has exceptional detail inside and out, with multiple functioning parts. Well made in die-cast, it features a working header and pull out spout, opening flaps, steering and opening grain containers. Britains feature on the list more often and this is why, they have a bigger range in toy combine harvesters than any other. Features detachable header that rotates and moves up and down, enclosed cab, rear steering and rotating swinging grain auger. 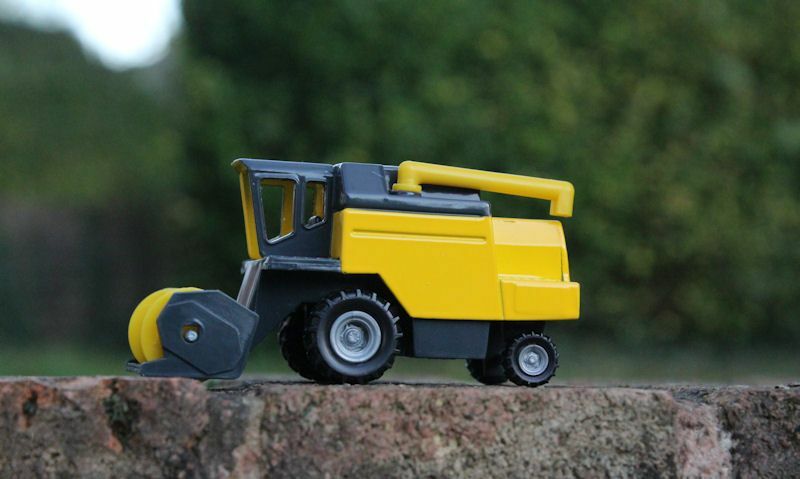 Small, cheap pocket-size Siku Combine toy, and well tiny, it still packs a powerful punch out on the field. The header moves up and down well it rotates when on the ground, free rolling wheels and a pull out grain tube. 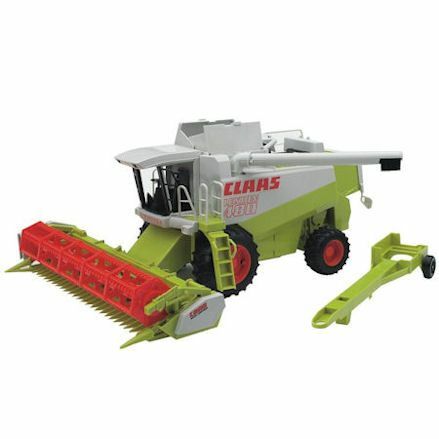 Siku Claas combine offering once again on our list, only this one is in a whooping 1:32 scale, and provides many more features and functionality. Well moving on free rolling wheels and tracks, the header rotates and the spout moves. 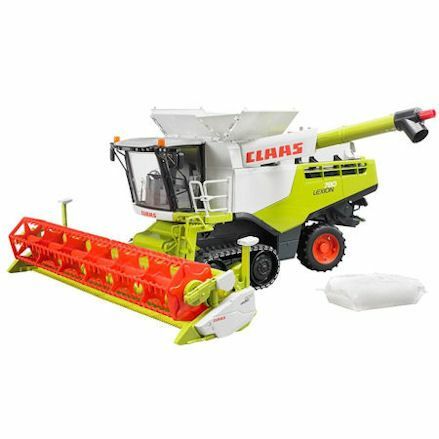 Claas win's the competition for most models on our list, and finally we have this giant size Bruder Claas combine - in their distinctive green with red rims. If you have the room in the house or garden, the moving header rotates, has a pull out spout with access to grain tank and driver's cab door opens. Beautifully made wooden Brio combine with free rolling wheels for use on the track with the trains or as a stand alone on the carpet to use on your Brio farm layout. Features a rotating head with an up and down action with the header.